SEATTLE, WA--(Marketwired - Jun 25, 2015) - RealNetworks' GameHouse division, one of the world's largest developers, publishers and distributors of casual games, is announcing the global launch of Delicious Emily's Home Sweet Home, the eleventh new time-management game in the Delicious franchise designed for women who love romantic comedies and who enjoy being challenged by all that life can toss at them. "The franchise's storyline has become so engaging that it rivals popular TV series," said Chief of Games Erik Goossens. "With hundreds of thousands of loyal fans, the main character, Emily, moves to a new town with her husband and young daughter, only to experience incredible challenges." She has planned a wedding requiring unfathomable logistics and sacrifice of sanity. She has suffered a crisis of self when confronted with her husband's desire to start a family before she is ready to give up her life as an entrepreneur. Most recently, she has faced the challenges of combining running a restaurant together with being a mom. In Delicious Emily's Home Sweet Home, Emily and her family move to a new town where they experience challenges with their new home and neighbors. See the trailer. 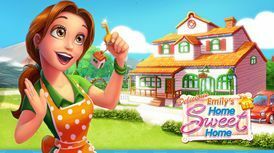 Availability: Delicious Emily's Home Sweet Home is available now at gamehouse.com and zylom.com, and in all app stores (Google Play, Amazon Appstore and iTunes) to trial for free. Or players can sign up for FunPass at gamehouse.com and zylom.com and play the full version of this game and all other 2,300 games with no ads or time limits. GameHouse develops and distributes games that people love to play and share -- all across the widest mix of channels including social, smartphone, tablets, and desktop. Today millions of players enjoy GameHouse games, a number that grows daily through a diverse business model that includes direct-to-consumer websites, social game development, and cross platform publishing, licensing, and technology.